Beka Brakai Chhok did not reveal itself slowly. Rather, as I rounded the final spur on the way to base camp, there it was, a white pyramid of snow and ice dazzling against the dark blue of the sky. It seemed obvious which point was the apex. The south peak rose directly above me, trailing two lesser domes like subsidiary carriages to a train. The others—blunt monoliths—couldn't compete. At home, in New Zealand, I'd spent months poring over Wolfgang Heichel's 2003 first edition of Chronik der Erschlieung des Karakorum, searching for an unclimbed mountain. I wanted something remote, around 7000 meters and doable. Beka Brakai Chhok, in the Batura Muztagh region of Pakistan, seemed perfect. The photos of its triple peaks displayed a sparkling symmetry and clarity. Lydia Bradey and I had arrived in Pakistan in early June 2007, with little information apart from Heichel's book and a vague knowledge of an attempt by British soloist Peter Thompson, who reached 6315 meters on the northwest ridge of the mountain in 1998. 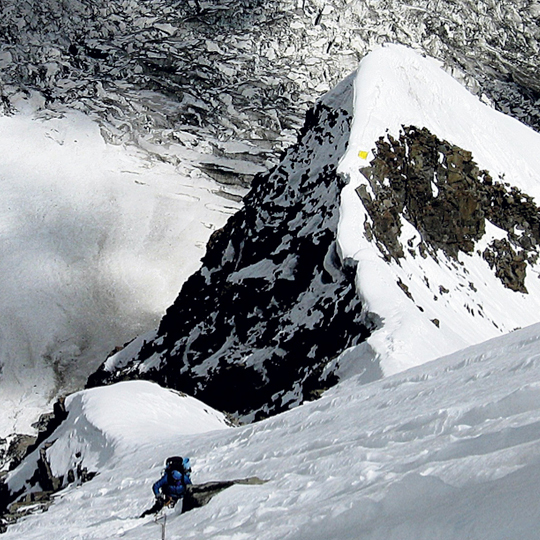 He was turned back by a section of convoluted knife-edge ridge beneath the central peak. Lydia and I were intent on making the first ascent of the south peak, which we believed to be the highest of the three summits, at 6940 meters. We spent four days walking into base camp with our porters, then a week ferrying loads ten kilometers to the base of the mountain. At Camp I, we lay awake, dizzy with anticipation. "That yellow bird at base camp, it was a sign of our imminent success," one of us joked. "That rock shaped like a 'P' is also a sign,' said the other. At Camp II, we pitched the tent on the edge of a drop into a shadowy icefall, which flexed and groaned like a restless animal. We spent an hour chopping out a platform—mere practice for the three hours we'd need to cut into the black ice for Camp III, where we squashed lengthwise across a thin arete, only two-thirds of the tent upright. After scrambling up seventy-degree grey ice, we placed Camp IV atop "Big Blob," a giant ice fungus clinging to the southeast rib. The rib would lead us to a broad, dark rockband; the rockband would take us to the upper ice slopes; and these would bring us up the untracked snows of the summit pyramid. But sometime in that night came a subtle shift in mood. I developed an altitude headache. We admitted that, after four days, we were only halfway. Up close, the rockband seemed menacing, overhung and rotten. Most significantly, and stupidly, we were down to the final two gas cylinders for our stove. The thrill of potentially being the first to summit had kept us from seeing the truth. The route we'd chosen was too hard. We'd brought too few supplies. We were traveling too slowly. The next morning, we abseiled off. I couldn't let go of the mountain, however, and I couldn't work out why. Perhaps, I felt that we'd made too many mistakes, that we hadn't given it our best shot. The following year, Malcolm Bass and I chose a different line, up a convoluted glacial slope to the south ridge. Time drifted by in a haze of heady certainty. After four days of climbing, we were at 6400 meters and poised for the summit. The air was windless and clear. That night, the barometer dropped. By midnight, it was snowing. "Not to worry," Malcolm said. He peered out at flakes falling through the orb of light cast by his headlamp. "We have enough food and gas to wait a day or two." A day or two became three, and with each passing hour, I saw the summit slipping away, yet again. By Day 4, we were running short of food. By Day 5, we'd finished Joseph Wambaugh's Hollywood Station, our only book, a detective story of intrigue amid the underbelly of LA society—the pages of which we'd torn out to share with one another. On Day 6, we made a pact: when the weather cleared, rather than bolt for base camp, we'd go up—even if we were down to a serving of porridge and two frozen protein bars. In the evening, the clouds rolled back to reveal the nearby Batura Wall tinged with orange, the shining rock spires of Hachindar Chhish and Anikucho Chhok, the fluted summit of Dariyo Sar. We sat outside the tent planning, too busy for the view: at midnight, we'd take the stove, the down jackets and the bars, reach the top and be back within twenty-four hours. As we climbed through the moonlight, my heart sang. The mountains shone, silver and translucent. The sun rose as we traversed the south ridge wading through loose, unprotectable snow of unknowable depth, its surface reflecting only white. I put a foot through a cornice—there was the Toltar Glacier hundreds of meters below, its many folds of distant ice like the hide of an albino elephant—and I leaped back, terrified. Two hours later, I was belaying Malcolm, who was out of sight, leading in small jerks. Then, a distant yell: "I'm coming back." "It's too dangerous," Malcolm said at my little stance, hugging me. I couldn't stop crying. We descended. As we drove back to the village of Chalt, we encountered a Jeep with two men who looked like climbers. One had a thin, tanned face; the other wore spectacles. We learned later that Simone Moro and Herve Barmasse were going for Batura II, then one of the highest unclimbed summits in the Karakoram. When the Italians discovered a large Korean party on Batura II, they changed their objective to Beka Brakai Chhok. They followed the same route as we did, but climbed without a tent, sleeping bags or stove. Five pitches past our highpoint, they reached the plateau below the summit pyramid. They sat out the night huddled in a crevasse. The next morning, they spent an hour trying to warm themselves in the sun's rays, before completing the final 400 meters of sustained and nearly vertical mixed terrain, almost devoid of protection, stopping just below the summit cornice. It was a brilliant ascent by two of the world's best. Unbeknownst to any of us, a debate about the true summit of Beka Brakai Chhok had been raging for decades. A 1978 Chinese map marked the central peak—not the southern one—as the highest at 6882 meters. Twelve years later, the cartographers of the Swiss Foundation for Alpine Research adopted the Chinese altitudes. In his 2003 book, however, Heichel attributed the height of the south peak as 6940 meters and, in one photo, gave 6830 meters for both the central and northeast peaks. When Karakoram historian Eberhard Jurgalski began to doubt the heights listed in Heichel's book, he wrote to one of the Swiss Foundation mapmakers, Jerzy Wala, who informed him that the correct height of the southern peak should be 6850 meters and that of the central peak, 6882 meters. According to Jurgalski, further errors were found in 2013: the elevations for the northeast peak and the central peak had been switched, and the south peak was, in fact, only about 6810 meters, the lowest of the three. Meanwhile, I'd gone off blithely to climb the south summit, thinking it was the apex of the entire mountain. Twice. But the mystery, it seemed, was now solved. Or was it? Having recalculated the heights using a photo taken by Hubert Bleicher near the summit of Sani Pakkush and a program named Geopix created by US mathematician Edward Earl, Jurgalski discovered that the northeast summit is the highest—higher even than it appears on the German Alpine Club map. What's needed, now, is for someone to take measurements from all three summits with the same equipment. So who will do this? Who will reach the real summit? Future alpinists will likely try the south face because it is the most direct line, or make the long, technically easier traverse from the south summit. The route will be sustained, on ice, with limited sites for a tent. Unless they are superheroes like Simone and Herve, the climb will take multiple days. The prize if they are successful? 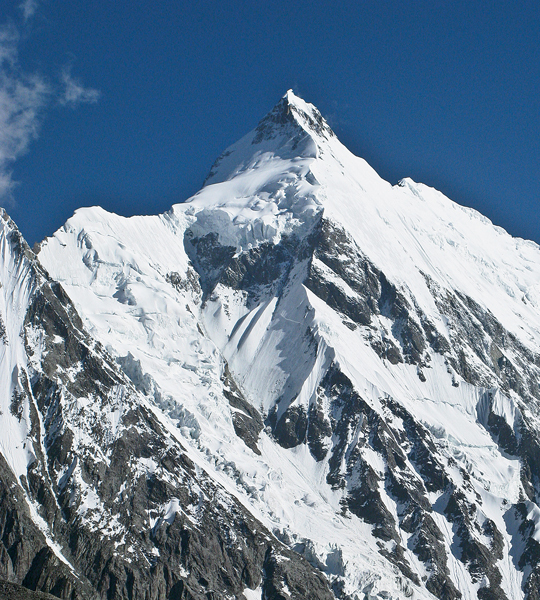 A first ascent of one of the few untouched Karakoram summits of this height. A chance to prove their technical ability. To climb a mountain with enough allure and beauty to draw me back—at any height.